How does a Solar Tracker produce more energy than fixed arrays? Three factors that add up to the Tracker’s overall advantage over fixed-mount arrays, typically around 40%. During the summer half of the year—from the day after the spring equinox to the day before the autumn equinox—the sun is rising out of the northeast and setting in the northwest (in the northern hemisphere). The “ideal” fixed-mount solar array is oriented due south, since that is the way that it will produce as much energy as it can. However, any time the sun is in the northern half of the sky, which occurs in the morning and afternoon for half of the year, the sun will then be behind the fixed array. The Solaflect PV Tracker, on the other hand, turns to face the sun each dawn and follows it all the way through sunset. In essence, the Tracker experiences a longer day throughout the summer half of the year. The graph below shows how extreme the advantage can be. 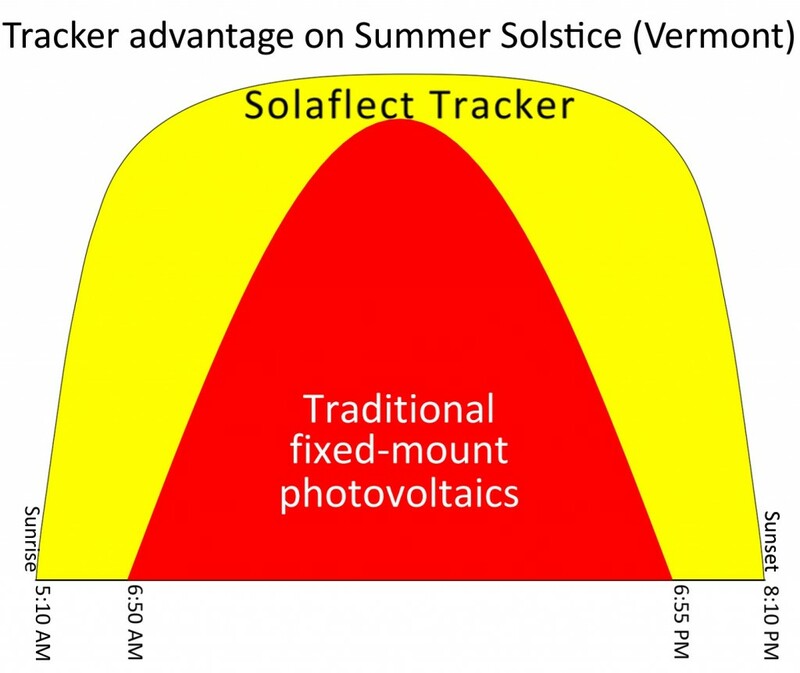 On the summer solstice here in Vermont, there are more than 3 hours that the Tracker can see the sun and produce power that is lost time to an ideally oriented fixed array. The other days of the summer half of the year are not quite as extreme, but all of them offer some amount of this advantage for tracking. It’s true that this advantage is only available in full to those locations with an open view of the sky from sunrise to sunset. Trees, buildings, or hills to the east and west will reduce the tracking advantage to some extent. We offer free site assessments so that we can analyze your specific site conditions and let you know just how well the Solaflect PV Tracker will perform for you. Contact us to schedule your free site visit. Facing directly at the sun means receiving the maximum of the light’s energy. Sunlight falls on a fixed-mount solar array from an indirect angle at all times of the year except two moments. (The precise moments will depend on the tilt and orientation of the array. The ideal fixed-mount array will be perpendicular to the sun only at solar noon on the two equinoxes.) A seasonally adjusted array that has a different tilt for the summer and winter halves of the year will be perpendicular to the sun at only four moments. Because of this indirect angle to the sun, some of the potential light is lost. Some passes by altogether, and some reflects off as glare. The Solaflect PV Tracker, on the other hand, turns to face the sun throughout the day, from sunrise to sunset, every day of the year. All of the potential light is received by the solar panels, allowing them to perform at their best. In New England, snow is a regular part of life for a significant portion of the year. A solar panel with snow on it will not produce much, if any, energy. If you have a fixed-mount solar array, you either need to be able to safely access your panels to brush them clean, or leave snow on them until it melts off by itself. Depending on the weather, this might take weeks to happen. Meantime, the Solaflect PV Tracker spends all night in the vertical orientation. Whatever snow that might have accumulated on it during a daytime snowfall sloughs off. Snow that falls at night passes right by the upright panels. A little skim of snow may stick to the panels, but this burns off within an hour or two of the next sunshine. As a result, the Tracker loses virtually no production to snow accumulation. 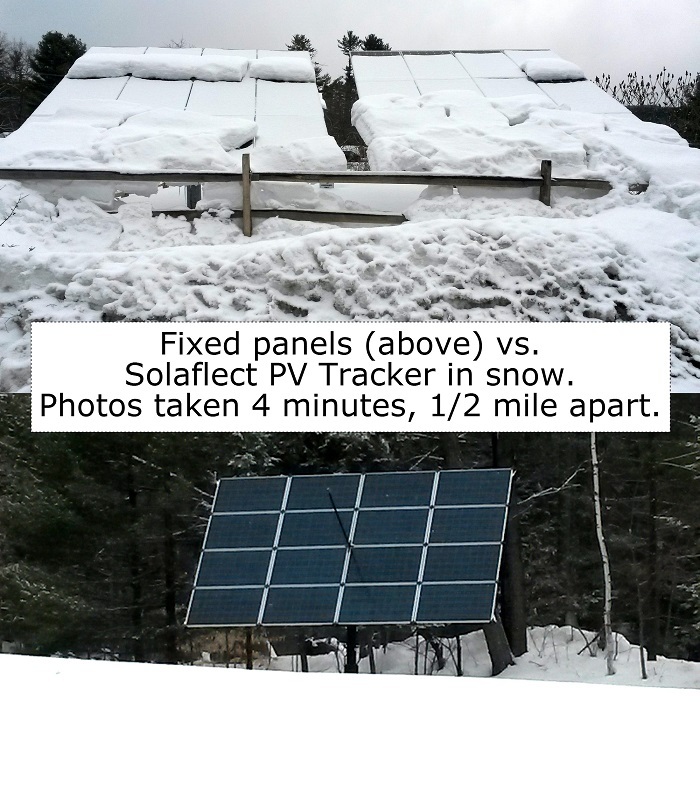 The image above shows a comparison between a fixed-mount array and a Solaflect PV Tracker on March 3, 2015. As you can see, the Tracker is perfectly clean, taking in all the available sunlight. The fixed-mount array, on the other hand, is fully covered in snow and producing zero energy. If you look closely, you can see that over the course of the winter, snow on the fixed-mount array has been sliding off always to the same place, so that a snow bank has formed. The snow bank is so tall that it reaches up to the bottom edge of the array. Even if the panels warm up a little so that the snow would be able to slide off, the snow has nowhere to go—it is trapped on the fixed panels because of the snow bank. The Tracker does not have any issues with creating snow banks, because it moves throughout the day and is vertical at night. The snow from each different snow fall tends to fall off in different places, so no one place develops a bank. One of our commercial customers, who has both fixed-mount panels and Solaflect PV Trackers, shared their production data with us. Their 60-kW fixed-mount array produced a total of 139 kWh in a typical winter month. Meanwhile, their 84-kW Tracker array produced 9,750 kWh. Adjusting for the difference in capacity, the Tracker array produced 50 times more energy than the fixed-mount solar panel array!